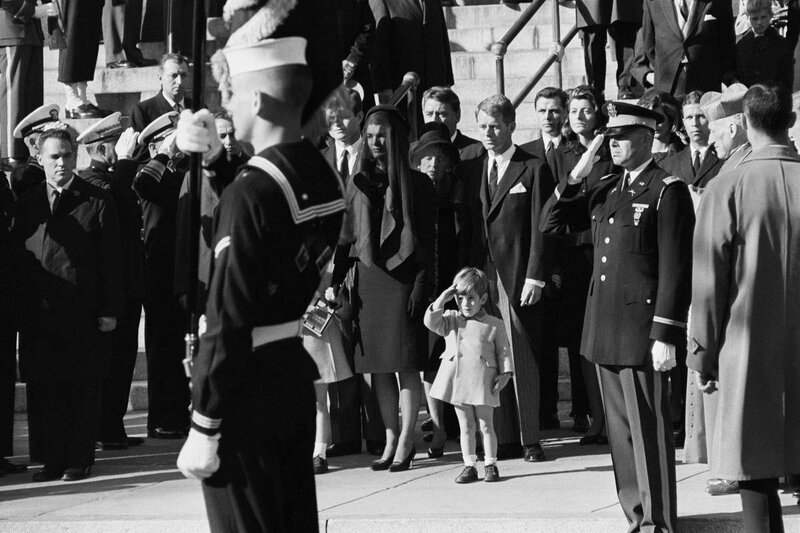 November is a solemn month for many people around the world as they remember those of us who've been tragically left behind. So to commemorate, let us bow our heads, respect the minute's silence, and check out the following comic book created by Scott Lobdell, Pete Woods, and published by DC Comics. Amen. When Bruce Wayne last saw Jason Todd, he was too busy punching him in the face to care less about his feelings. Now though, well, now all of that has changed, big time, because Jason's best friend, Roy Harper, has tragically passed away, and now it's up to Bruce to break the terrible news. Now, the first thing I would like to mention, is the fact that this issue is a very introspective issue to read, especially in terms of story development, because even though most of the action happens in the span of the first four pages, the rest of it was devoted to a very emotional reunion between Jason and Bruce. 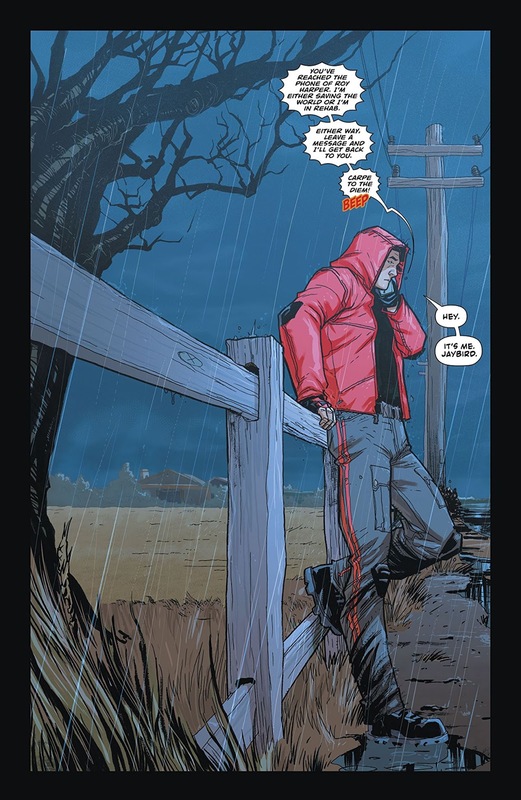 Well, as most of us should know, Roy was one of the many victims in the massacre at Sanctuary (check 'Heroes in Crisis' for more details), so it should come as no surprise that Scott Lobdell would want to address this regrettable event right here, in this very episode. As I’ve pointed out in previous reviews, Lobdell has a talent at writing powerful and emotionally charged stories where his focus isn't on physical actions, but rather, the human interactions between the characters. In this episode, for instance, he shows us his deep understanding of what Jason's actually like, both as a person and as a hero, going so far as to go slightly 'meta' and lampshade the usual narrative tropes present in superhero storytelling. To some extent, this degree of self-awareness can sometimes be rather tricky to construct and inadvertently undermine the impact of whatever is being highlighted. In this case though, no, it melds perfectly with Jason’s past and personality, and shows us that he has learned and grown a great deal through his many, many adventures. I also enjoyed Lobdell’s take on Bruce Wayne as well. Instead of depicting him as if he were a cold-hearted crusader, out for revenge, he humanizes him and turns him into a normal human being, like a concerned parent, who's trying to reach out and support his estranged son. Now I know that some of you out there have criticized this confrontation because it doesn’t have them talking about the fight they had in Gotham (A fight, some might say, that Bruce should apologize for). But as far as I'm concerned, I feel those criticisms have missed the point entirely. 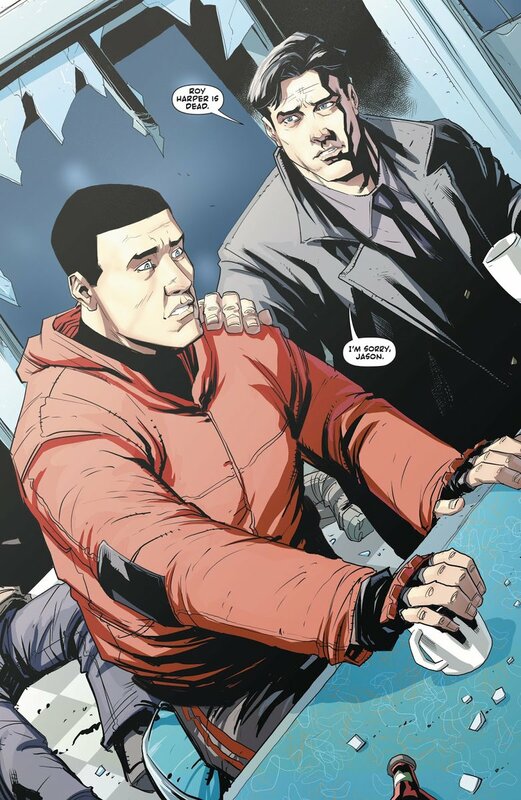 After all, Jason loves Bruce and Bruce loves Jason, without forgetting to mention that the two of them are emotionally broken men who would rather push forward and accept their tragedies instead of dwelling on them. Admittedly, Lobdell's reunion may come across as being a bit clumsy, but at the same time, this is exactly what makes it so powerful and relatable to read. Now, where the art is concerned, I'm happy to say that Pete Woods continues drawing this book to the best of his ability; which, in my opinion, occasionally produces some pretty mixed results. On the one hand, there are still some minor issues in the way he illustrates people's faces, while on the other, the tone of the story allows him to express another artistic facet he's very experienced at: That being, using the characters’ expressions to tell a story without the use of words. You see, Lobdell has constructed this issue so the visuals are just as important as the dialogue -- which adds a whole new layer of complexity to the artist’s responsibilities. But thankfully, with Pete being Pete, he manages to live up to the task by posing and constructing his characters in a bold and expressive manner, in order for them to compliment the dialogue being spoken. He's also in charge of coloring duties too, and I must say, other than having a more standard palette compared to the previous issue, he continues delivering some top quality work. Thumbs up! I originally wanted to pick a good song relevant to Roy’s unfortunate passing for this months musical match-up, but in light of Jason’s acceptance of this tragic news, along with his belief that Roy will come back sooner or later, I think that Pennywise’s “Bro Hymn” would be a perfect match instead. The only possible comparison I can come up with for this episode would have to be that of a funeral. After all, Jason wants to be able to say goodbye to Roy and remember him as the best friend he ever had. This issue is by far one of the best issues Lobdell has ever written, because it goes straight to the emotional core of Jason and Bruce's relationship, and it's complemented with some wonderful art by Pete Woods. It is truly a great read, and certainly one for the collection.